Chocolate Chip Cornflake Cookies are the world’s best cookies with chocolate chips! These are a hit whenever I make them! Plus that gooey chocolate – OMG, right? 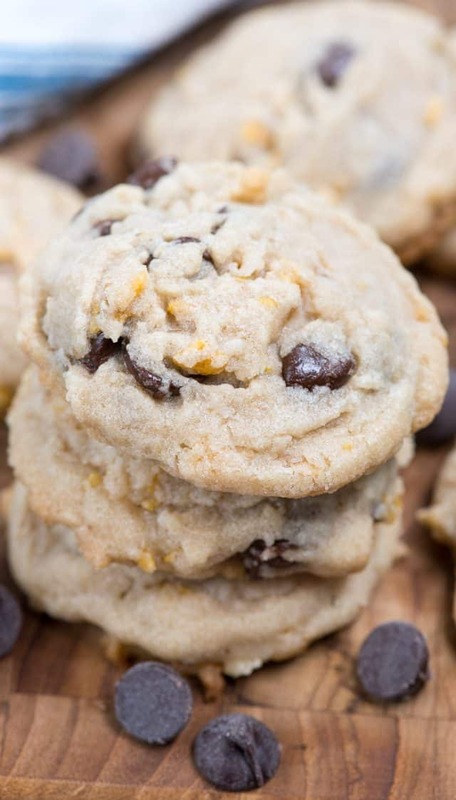 Before we get to the amazingness that is these Chocolate Chip Cornflake Cookies, let’s talk summer reading. I’ve read several good books lately I have to recommend! Luckiest Girl Alive by Jessica Knoll – I actually saw Jessica on the Today show and she recommended most of the books on this list. She didn’t plug her own, but I bought it anyway and I really liked it. I read it in only a few days and while it was basic Chick Lit, there was a twist I didn’t see coming (rare, for someone like me who reads a LOT). Tell Me Lies by Carola Lovering – while I think the author could have cut out a few chapters, I really enjoyed this book. It kept me coming back – I read it in just a few days – and I really loved the way she developed the characters. All We Ever Wanted by Emily Giffin – this is the author who wrote Something Borrowed and Something Blue, and I love all her books. This book should be required reading for the parents of all teenagers today – boys and girls. I may actually even make Jordan read it. The core premise is that a boy sends a photo on snapchat that basically implodes his life. It’s a great warning to parents about what kids are doing. And if you read this and think “not my kid” then, well, good luck. When Life Gives You Lululemons by Lauren Weisberger – again another famous author. I actually just started this book but I bet by the time you read this I’ll be done with it. It’s classic Weisberger and a great summer read. What’s the best thing to do while reading? EAT COOKIES, OF COURSE. 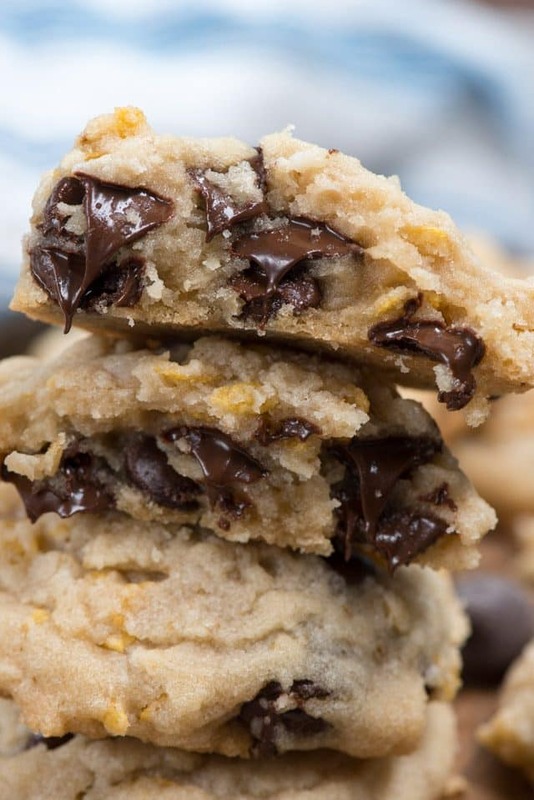 This recipe is basically the World’s Best Cookies with chocolate chips inside. And they’re HEAVEN. I really do think that this recipe produces some of the best cookies I’ve ever had. They’re soft and crunchy and chewy and dense and light all a the same time. World’s Best Cookies are basically cornflake cookies; they’re a cookie born in the 70s (only back then would someone add oil and butter to a cookie recipe). I took it one step further this time and added CHOCOLATE. Try just eating one of these cookies I dare you. What is a cornflake cookie? It’s a cookie with cornflakes, ha! Basically, these could also be called Kitchen Sink Cookies. They have cornflakes, coconut, chocolate, nuts (optional), butter, oil, oats, and flour. 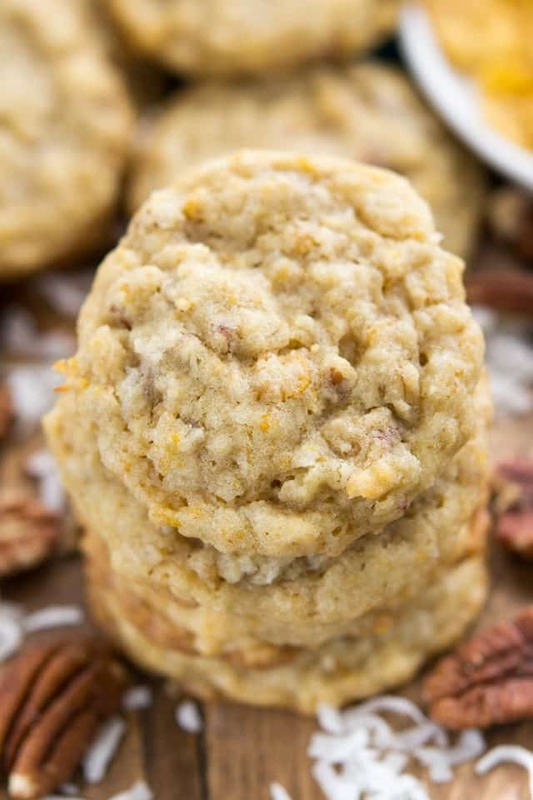 Empty your pantry and make these cookies! Chocolate Chip Cornflake Cookies are crunchy and chewy and soft and are super gooey with chocolate chips. These are the World’s Best Cookies, with chocolate! You can use a hand mixer or a stand mixer. If you’re using a hand mixer, I recommend that you crunch up the cornflakes before adding them. A stand mixer will do that for you. For the gooey chocolate pull shown, use Trader Joe’s Chocolate Chips. They stay soft and gooey forever! 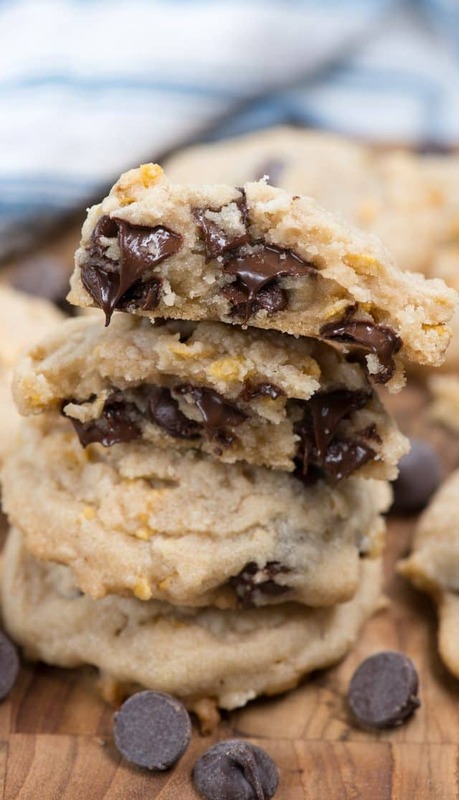 Chocolate Chip Cornflake Cookies are the world's best cookie full of chocolate chips! These are soft and chewy and crunchy all at the same time! Mix in oats and flour until just mixed. Stir in coconut and cornflakes, then stir in chocolate chips. I love using Trader Joe's Chocolate Chips for the most gooey cookies! Love using cornflakes in recipes? Be sure to try this Cornflake Crust or these Chocolate Cornflake Clusters! World’s Best Cookies really are the best cornflake cookies! Doubletree Chocolate Chip Cookies are another favorite! 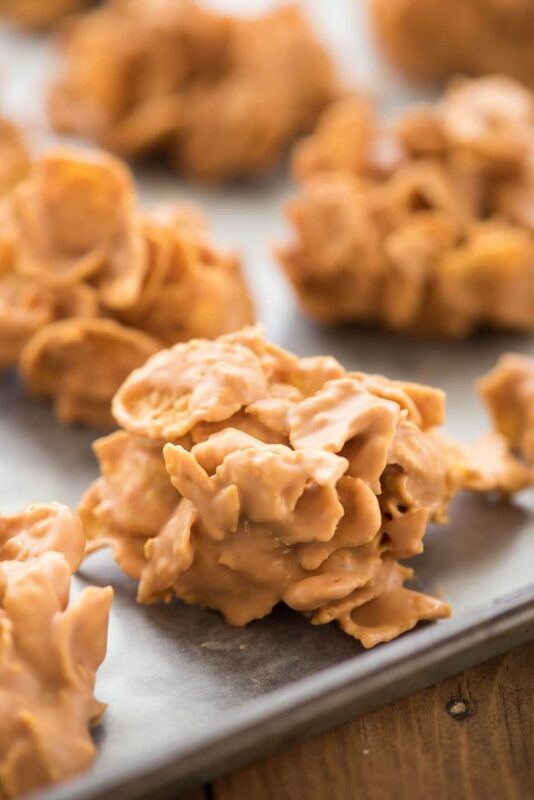 Cornflake Clusters are another way to use up cornflakes! These look incredible and just yesterday I made cookies with both oil AND butter. It was a cookie recipe I found online, probably from the 70s. Lol. These cookies look incredible. Perfectly underbaked too….mmm the best! I did not know you were such an avid reader. I can get through precisely 4 pages of a magazine before I fall asleep. Chocolate can only make things better especially cookies!!! YUM! This is my favorite. And thanks to this article I can do it myself ! Looks like another winner. Plus, you must be an expert at time management. All We Even Wanted by Emily Giffen.